The Ariane 5 rocket on the launch pad Tuesday (Sept. 20) afternoon. 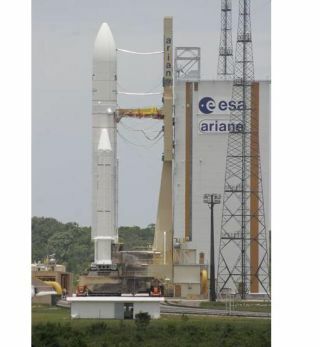 KOUROU, French Guiana -- The rocket was healthy, the satellites were configured and the weather was picturesque, but an unexpected labor strike stood in the way of liftoff of an Ariane 5 launcher Tuesday with two payloads to serve the United States and the Middle East. The strike involved workers who operate radar trackers that follow the Ariane 5 rocket's ascent into space, according to Jean-Yves Le Gall, chairman and CEO of Arianespace, the rocket's commercial operator. "It's been going on for some time," Le Gall said. "It's been quite a difficult situation for us." After completing checks of the Ariane 5's upper stage, an issue which delayed launch from early September, Arianespace proposed rescheduling the flight for Saturday, Sept. 17. But the Trade Union of French Guiana Workers threatened a strike. Company officials thought they had struck an agreement with workers to launch Tuesday, but launch controllers halted the countdown about seven hours before the scheduled liftoff. The union represents workers from Telespazio, a major Ariane subcontractor based in Italy. "We had confirmed a launch for tonight," Le Gall said. "I am very upset over the situation." The dual-payload launch was supposed to blast off at 2138 GMT (6:38 p.m. local time; 5:38 p.m. EDT) from the Guiana Space Center, the French-run space base on the northeast shore of South America. Built on the edge of the Amazon rainforest, the space center is Europe's launch site for Ariane 5 rockets. Arianespace and CNES, the French space agency, plan to negotiate with the trade union later Tuesday and into Wednesday in hopes of launching Wednesday night. The workhorse Ariane 5 launchers heave large communications satellites into orbit two at a time. They also deliver cargos for the International Space Station and research payloads for the European Space Agency. Artist's concept of the Arabsat 5C satellite in orbit. The Arabsat 5C and SES 2 communications spacecraft are stacked inside the Ariane 5 rocket's nose fairing for blastoff. Both satellites are in a stable condition awaiting launch. Arabsat 5C, a massive European-built 10,183-pound satellite, will offer broadcasting, telephony, professional communications, Internet routing, VSAT and interactive services across the Middle East and Africa. The spacecraft was built by Astrium in France and is based on the company's Eurostar E3000 platform. Thales Alenia Space developed Arabsat 5C's communications instruments, which include four deployable antenna reflectors, 26 active C-band transponders and wide-band transponders over 10 locations in Ka-band. Riyadh-based Arabsat procured the spacecraft to replace Arabsat 2B, which was launched in November 1996. Arabsat 5C rides in the upper position inside the Ariane's payload fairing. The SES 2 satellite is firmly attached below inside a drum-like apparatus designed to accommodate two spacecraft on one launch. Artist's concept of the SES 2 satellite in orbit. Ordered by SES to replenish its fleet of satellites covering North America, the 7,000-pound SES 2 craft will be stationed at 87 degrees west longitude. The satellite's C-band and Ku-band transponders will reach customers across the United States, parts of Canada and the Caribbean. SES 2 was manufactured by Orbital Sciences Corp. It is one of three virtually identical satellites built by Orbital for SES and launched in 2010 and 2011. The U.S. Air Force's Commercially Hosted Infrared Payload, or CHIRP, is a piggyback instrument aboard SES 2. It will demonstrate infrared detection technologies from geosynchronous orbit for missile warning applications. The 166-foot-tall rocket is tailored for dual-payload missions, and Friday's flight will be the Ariane 5's fifth launch so far this year. One of the flights hauled the European Space Agency's Automated Transfer Vehicle toward the International Space Station.